Texecom’s research shows there’s a yawning gap between what end users want and what security systems currently deliver. The irony is that, while security and peace of mind are high on the list for end users, once a security system is installed, most people simply don’t use it. Despite the average cost of a burglary in the UK being £2,525, only 33%​ ​of​ ​people​ ​with​ ​a​ ​security system​ actually ​turn​ ​it​ ​on. This may seem irrational, but the truth is that traditional alarms are often see as a ‘grudge purchase’ for domestic users. It’s not something people buy because they want to – they do it because they feel they must, to protect their homes and their families. Texecom Connect puts users in control of building automation. From checking that appliances are turned off to receive notifications when children come home, it personalises how people automate their homes. It adds value to security systems by delivering the features and benefits that end users are demanding, giving them the flexibility and freedom to enjoy an interactive and positive experience. Security installers can really benefit from this by offering systems that don’t feel like a ‘grudge purchase’. Cameras also come into their own when controlled by Texecom Connect. With the app, users can monitor their cameras from anywhere in the world, from checking on their children or pets to making sure their automatic home lighting has been turned on. Ricochet-enabled perimeter security systems offer real peace of mind by putting off an intruder – whether an opportunist or a planned break-in attempt – before they get near the property. Lights or alarms can be triggered using a variety of acoustic and vibration detection devices. Whether it’s an outdoor motion sensor or a wireless miniature contact for doors and windows, Texecom has the solution. 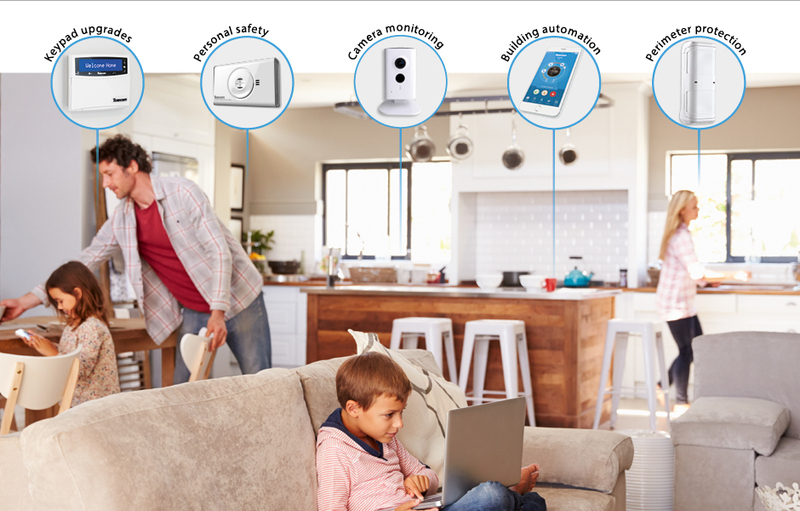 Texecom’s Ricochet mesh technology allows installers to offer commercial-grade, wireless carbon monoxide (CO) and smoke detectors to domestic customers. Built-in sounders provide stand-alone notification, while connectivity to Texecom’s Premier Elite control panels provides system-wide alarms and remote communication. The Premier Elite range of metal LCD keypads with blue-backlights are elegant and offer the very best in keypad design. Ideal for luxury homes and high value premises, these keypads can be used with both Premier Series and Premier Elite Series control panels and are available in a range of stylish metal finishes, including polished chrome, gunmetal and polished brass. Texecom offers installers the added-value benefits that end users are demanding. Whether it’s automation, cameras, perimeter security, safety devices and aesthetic upgrades like metal keypads, installers and integrators can up-sell and offer systems that don’t feel like a grudge purchase but instead add real value – to their customers and to their bottom line. Why Have Exterior Perimeter Protection?